Flexible Shaft Grinding machine is widely used in Fabrication Workshops, Foundries and heavy industries. It is very suitable for heavy and or lengthy jobs where it is not possible to lift the job or get the same close to the grinding machine. 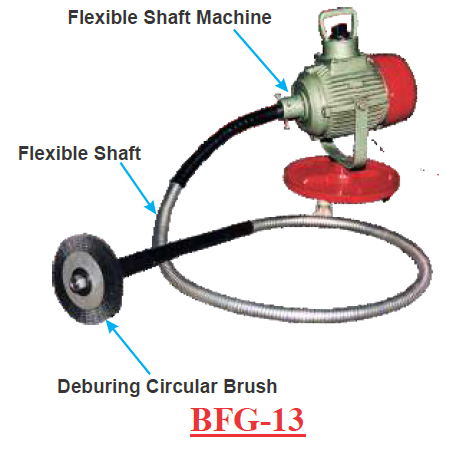 Each machine is supplied with a Flexible Shaft and Grinding Wheel. The machine can also be used for Buffing purpose by attaching an buffing attachment which can be supplied as an extra equipment. Machine is mounted on Castor Wheels and can be easily moved around close to the job. Dynamically Balanced rotor minimise vibrations and ensure smooth running. Construction of the machines are made sturdy and robust o offer vibration free performance. Collet attachment for mounted point grinding wheels can also be supplied at extra cost.